So, if you are like me at all, ordering food is sometimes a very stressful experience. Stressful in a there-are-so-many-delicious-options-I-couldn’t-possibly-choose-just-one kind of way. From time to time, it gets to the point where I am so indecisive that I have to just blurt something out and hope for the best. Sometimes I regret it, sometimes it’s perfect. My roommate cleverly calls this “blackout ordering”. It just so happens my first run-in with kale granola happened this way. I was at a lovely grain-free food-lover’s heaven called Hu Kitchen on a breakfast date when I couldn’t decide for my LIFE what I should get. (“You mean…EVERYTHING is gluten free? I can eat…ANYTHING HERE?” An indecisive, dietary-restriction-plagued girl’s nightmare. Commence panic attack.) So, I ended up “blackout ordering” a bowl of “sweet kale crunch” with almond milk. I could not even begin to understand why, of all things, I’d order a bowl of cereal made out of KALE at a restaurant, but I did–and, lo and behold, I loved it. 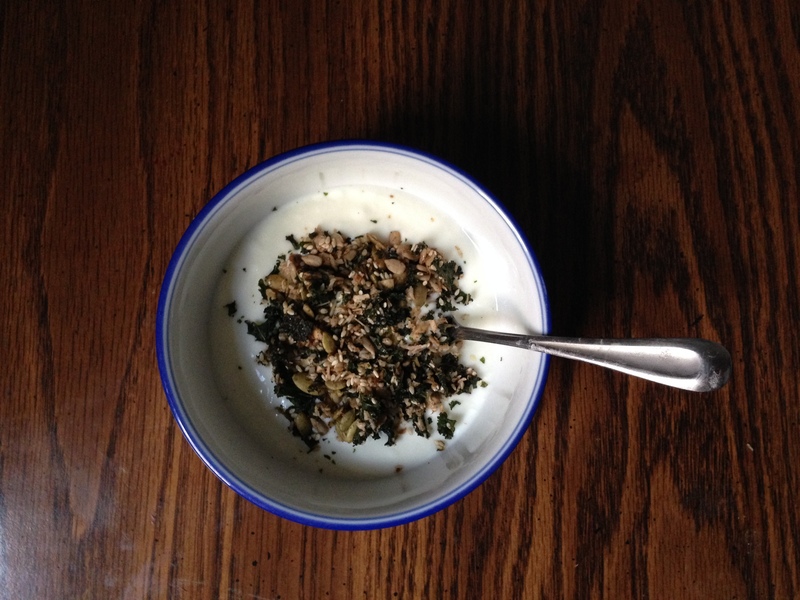 So, long story short, the metaphorical seed for my kale granola experiment was planted and this recipe was born. 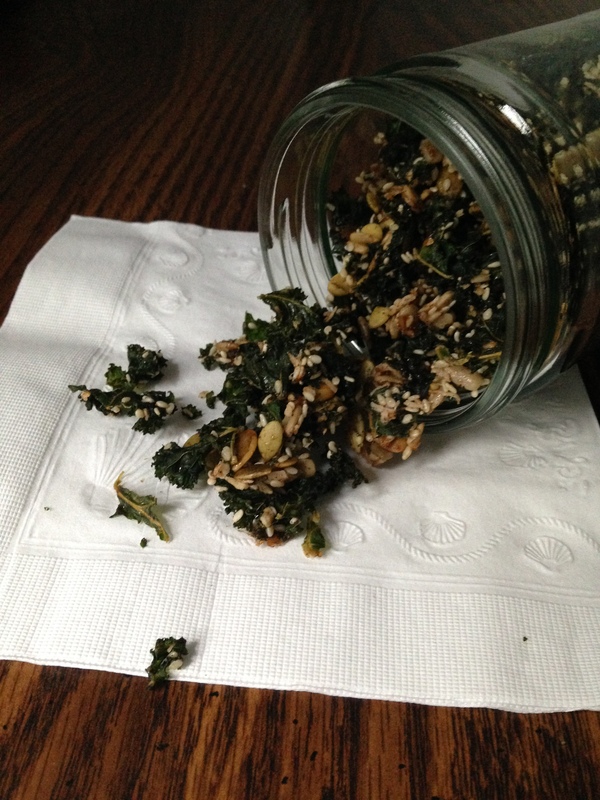 Think sweet kale chips, in a bowl, with milk or yogurt. 100% healthy, grain and gluten free “cereal”. Crunchy, delicious happiness. Need I say more? Preheat your oven to 200° F (or, if you’re lucky enough to have a dehydrator, you can obviously use that). Lightly grease a large baking sheet with coconut oil or line with parchment paper and set aside. Put your coconut oil in the microwave for a few seconds until just melted, then stir in the maple syrup. Let this cool for a bit–we wouldn’t want to wilt the kale! Put your little granola-bite-sized kale pieces into a bowl and pour the coconut oil and maple syrup on top, stirring to evenly coat. Add all your mix-ins (seeds, coconut, cinnamon) and the coconut sugar and toss to make sure it’s all mixed together. Try to not think of this as a salad–you will be tempted. Dump your kale and all of the other goodies onto the baking sheet and spread it out evenly. Bake for 1.5-2 hours at this low temperature (to avoid burning and for optimal crispiness! ), making sure to check every half hour or so just in case. Rotate the baking sheet halfway through to make sure all sides get evenly toasted. When you’ve decided your granola is just about done, turn off the oven and let it cool inside. Store in an airtight container (but not until it’s completely cool, guys!) and brag to your friends about how weird and amazing your new creation is. I, personally, cannot wait to force feed this to my reluctant non-kale-enthusiast lovers and friends. I also cannot wait to eat breakfast tomorrow. But what else is new. Categories: Breakfast, Snack | Tags: breakfast, gluten free, grain free, granola, healthy, kale, nut free | Permalink. I am now 100% gluten free. Therefore, so is this blog! It seems silly to make this announcement in February since it’s been true since the beginning of November, but I’ve been missing from my bloggin’ since this whole ordeal sooo…surprise! Turns out I have some weird food allergies/intolerances/who-knows-whats that have been causing some health issues for a while. It got really bad this winter, so I cut out gluten and am still working on identifying the other meanie foods that are hurting me. It’s all a process. Oh and for all you nonbelievers: Food intolerances are real and not just trendy. Believe me. When pizza and I broke up, I was beyond devastated. I wouldn’t wish this kind of heartbreak upon anyone. AND: things can be just as yummy gluten free as their gluten-y counterparts. Let me prove it to you! Preheat your oven to 325° and grease a large sheet pan with coconut oil or line it with parchment paper. Set this aside and grab a big bowl. Mix all your dry ingredients together. In a small bowl, melt down your coconut butter/oil in the microwave for 30ish seconds. Pour in your maple syrup/other sweetener, vanilla, and mix. Combine your wet and dry ingredients and spread evenly across your prepared pan. Stick it in the oven for about an hour, checking every 10-15 minutes to mix around and make sure nothing is burning (pay special attention to the coconut flakes! These little guys are needy–they burn easily). When I’m done, I usually turn off the oven and leave the granola inside as it cools so I can ensure crispiness without burning. The night (or a few hours) before you want to eat this yumminess, mash your banana and whisk it together with the almond milk. Add your chia seeds and almond butter and stir/shake/whatever your lil heart desires to make sure it’s well-combined. I put mine directly in my my roommate’s magic bullet and let it sit overnight in the fridge. When you’re ready to eat it, throw it in the blender for a little to combine. Or not. It’s not really necessary, but I like it better this way. 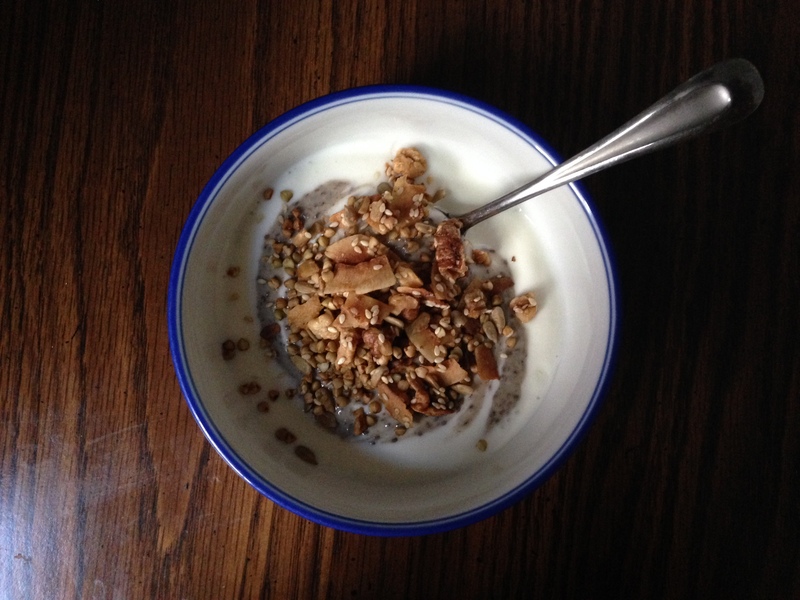 Serve over yogurt, topped with your new yummy granola! It’s the bomb. I could hardly sleep last night I was so excited for my breakfast-to-be. Happy weekend, lovely people. And happy 2014. It’s good to be back. 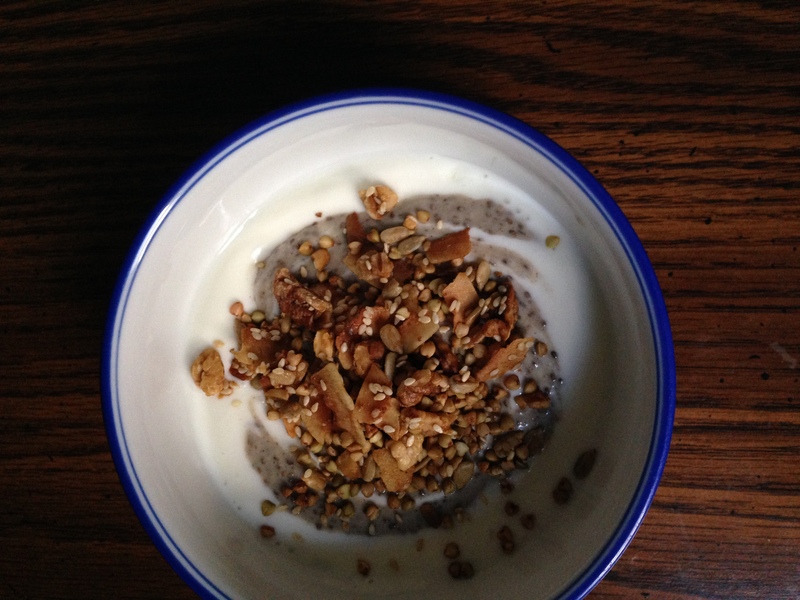 Categories: Breakfast, Snack | Tags: banana, breakfast, buckwheat, chia pudding, coconut, gluten free, granola, snack | Permalink. If you (like I) are a granola fan and have never made it yourself, do yourself a favor and try it. It’s really so much better. So fresh and so yummy and you control exactly what you put in it! Personalized granola! What could be better? This “fall granola” is a simple, seasonably appropriate apple-cinnamon-pepita combination but you can switch this up as much as you’d like to taste. Like I said last time I posted about granola, as long as you have a sweetener, an oil, and some oats, you can really just do whatever you want as far as the nuts/seeds/fruits go. You could even add chocolate chips if you wanted (gettin’ craaaazy up in here). But seriously though. 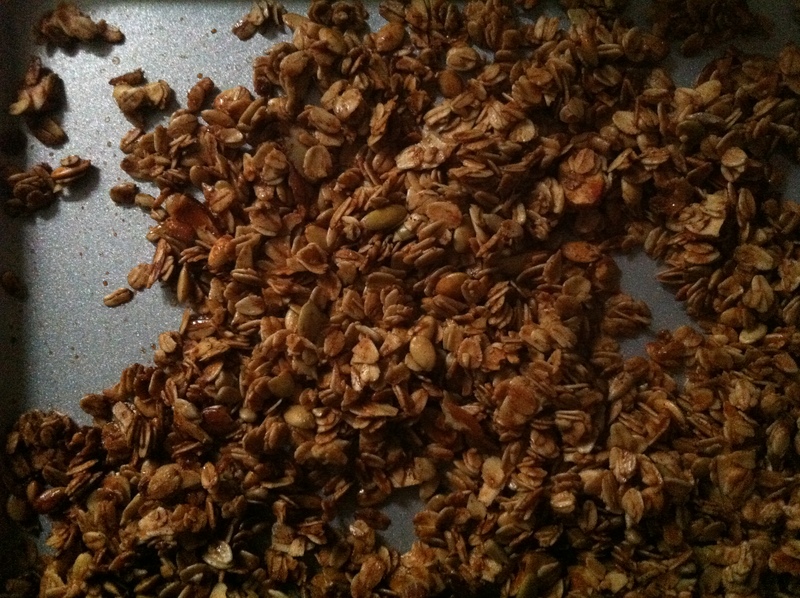 Make granola. It’s ridiculously easy, smells awesome, and tastes even better. Preheat the oven to 300° and lightly grease a large cookie sheet with coconut oil. Combine your oats, nuts/seeds and cinnamon and set aside. Melt your honey and coconut oil together in the microwave for about 45 seconds and stir in the vanilla. Add the wet ingredients to the dry and stir to combine. Spread the mixture evenly on the cookie sheet and place in the oven for about 45 minutes, stirring every 10-15 so that the granola browns evenly and doesn’t get too toasty. Once you take it out of the oven, let it cool completely before adding your dried fruit! Breathe in the delectable, cozy smell that will now feel your apartment. Store in an airtight container and try to pace yourself with your granola consumption (it’ll be hard). Have a beautiful day, friends. I’ve already decided I’m going to have granola for dinner, so I know I will. Categories: Breakfast, Snack | Tags: apple, breakfast, cinnamon, granola, honey, pepita, snack, sunflower seed | Permalink. Ohhhhh my god. Oh my god. Make this right now. This was my first time making my own granola and I don’t know what took me so long. My favorite muesli from Trader Joe’s was out of stock yesterday when I went grocery shopping and, although at first I was devastated, it made me realize I have a ton of perfect granola-making supplies in my cupboard and I should just do it myself! I need granola for finals. Need it. It’s my go-to “I don’t feel like preparing a real meal right now” meal that’s sufficiently healthy-ish (kinda) while still being snack-y. I promise you I will be on a granola-binge this week as a result of all the finals/move-out/end of the year stress that I will be experiencing. At least now I’m sufficiently prepared. I just ate a bowl of this nutty, oat-y goodness with milk and sliced bananas and I’m fairly sure I will never be quite the same. This was SO EASY and it’s SO YUMMY and it made the apartment smell like cinnamon and maple syrup. I’m back on my breakfast binge, ladies and gentlemen. And I don’t even regret it. Yet. Preheat the oven to 350. Line a baking sheet with tin foil and set aside. In a large bowl, mix everything but the dried fruit–but including the coconut, of course–until everything is sufficiently coated. (You may need to microwave the coconut oil for a few seconds to make it liquid-y.) Spread the mixture on your cookie sheet as evenly as possible. Stick it in the oven for 15-30 minutes (I do realize this is a big range, bear with me for a second), stirring every 5 minutes or so to make sure everything gets evenly toasted. Let it cool completely before stirring in your dried fruit and storing. I only left my granola in the oven for about 20 minutes or so, but I’ve seen recipes say to leave it in for as long as 45. I checked mine every 5 and it seemed like the edges were nearing their toasty peak by the 3rd time I checked, so I re-stirred and took it out soon after. I’m sure a lot of it has to do with your oven–just don’t make this when you absolutely must be otherwise occupied since you’re going to have to check it. You definitely wouldn’t want your precious granola to burn. 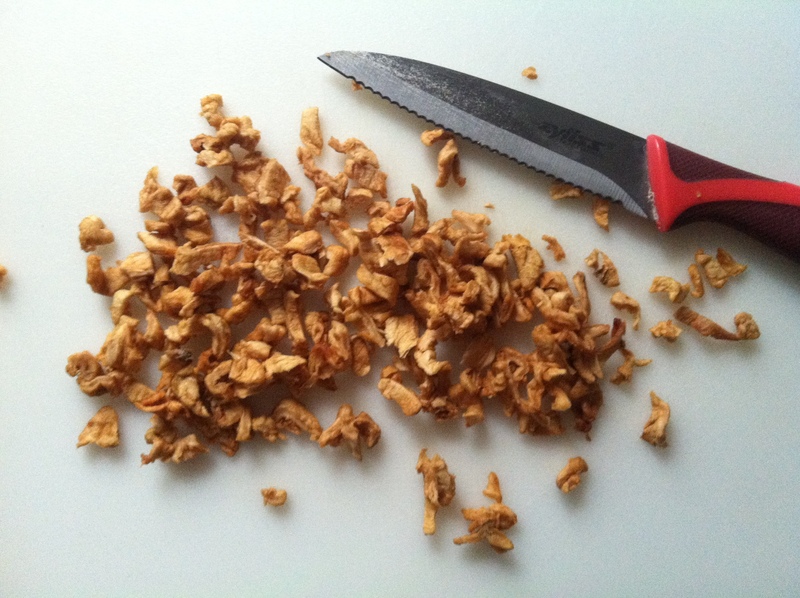 This goes without saying, but you can obviously use whatever ingredients you’d like in your granola. If you don’t like coconut or something, omit it. If you’re really into dried cherries, add ’em. 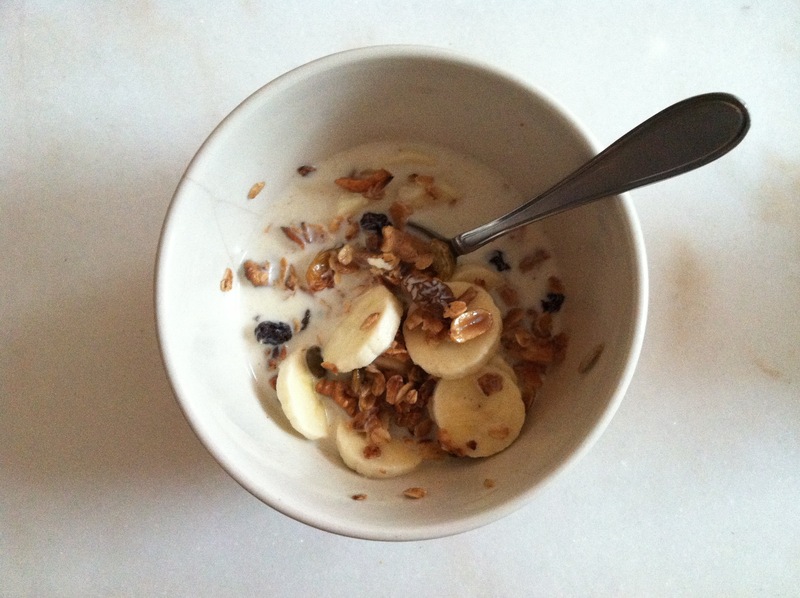 I bet you could make a really awesome banana-y granola using ripe mashed bananas. Or you could even add cocoa powder. Whatever you’d like, really! I’ll probably try more varieties and keep you posted. For everyone who’s crazy busy right now: hang in there! You can do it! Make some granola, it’ll make you feel better. 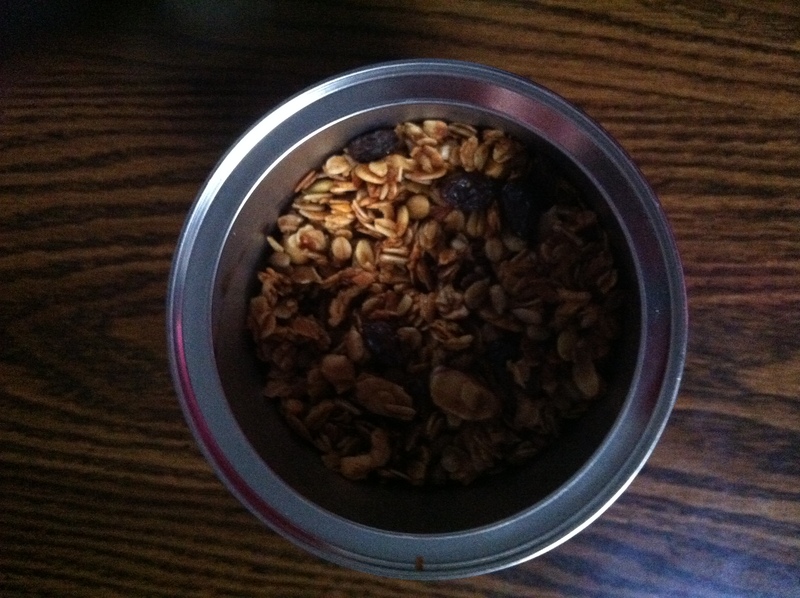 Categories: Breakfast, Snack | Tags: breakfast, cinnamon, granola, maple, nuts, oats | Permalink.